1. a substance used to impart color to tissues or cells, to facilitate microscopic study and identification. 2. an area of discoloration of the skin. acid-fast stain a staining procedure for demonstrating acid-fast microorganisms. differential stain one that facilitates differentiation of various elements in a specimen. endogenous stain an intrinsic stain acquired during tooth development. exogenous stain an intrinsic stain acquired after a tooth has erupted. extrinsic stain a stain that can be removed from a tooth surface by polishing. Giemsa stain a solution containing azure II-eosin, azure II-glycerin, and methanol; used for staining protozoan parasites such as Plasmodium and Trypanosoma, for Chlamydia, for differential staining of blood smears, and for viral inclusion bodies. Stained elements appear pink to purple to blue. Gram stain a staining procedure in which bacteria are stained with crystal violet, treated with strong iodine solution, decolorized with ethanol or ethanol-acetone, and counterstained with a contrasting dye; those retaining the stain are called gram-positive, and those losing the stain but staining with the counterstain are called gram-negative. hematoxylin and eosin stain a mixture of hematoxylin in distilled water and aqueous eosin solution, employed universally for routine examination of tissues. intrinsic stain a stain that is within the enamel of a tooth and cannot be removed by polishing. metachromatic stain one that produces in certain elements a color different from that of the stain itself. nuclear stain one that selectively stains cell nuclei, generally a basic stain. port-wine stain a persistent dark red to purple nevus flammeus that grows proportionately with the affected child and is usually found on the face. Initially it is macular, but the surface may develop angiomatous overgrowths with time. Port-wine stains often occur in association with other congenital abnormalities. supravital stain a stain introduced in living tissue or cells that have been removed from the body. tumor stain an area of increased density in a radiograph, due to collection of contrast material in distorted and abnormal vessels, prominent in the capillary and venous phases of arteriography, and presumed to indicate neoplasm. vital stain a stain introduced into the living organism, and taken up selectively by various tissue or cellular elements. Wright's stain a mixture of eosin and methylene blue, used for demonstrating blood cells and malarial parasites. 2. To color; to dye. 5. A procedure in which a dye or combination of dyes and reagents is used to color the constituents of cells and tissues. For individual dyes or staining substances, see the specific names. differential stain one which facilitates differentiation of various elements in a specimen. Giemsa stain a solution containing azure II-eosin, azure II, glycerin, and methanol; used for staining protozoan parasites, such as Plasmodium and Trypanosoma, for Chlamydia, for differential staining of blood smears, and for viral inclusion bodies. Gram stain a staining procedure in which microorganisms are stained with crystal violet, treated with strong iodine solution, decolorized with ethanol or ethanol-acetone, and counterstained with a contrasting dye; those retaining the stain are gram-positive, and those losing the stain but staining with the counterstain are gram-negative. hematoxylin-eosin stain a mixture of hematoxylin in distilled water and aqueous eosin solution, employed universally for routine tissue examination. metachromatic stain one which produces in certain elements colors different from that of the stain itself. port-wine stain see nevus flammeus. supravital stain a stain introduced in living tissue that has been removed from the body, but before cessation of the chemical life of the cells. tumor stain an area of increased density in a radiograph, due to collection of contrast material in distorted and abnormal vessels, prominent in the capillary and venous phase of arteriography, and presumed to indicate neoplasm. vital stain a stain introduced into the living organism, and taken up selectively by various tissues or cellular elements. To treat (a specimen for the microscope) with a reagent or dye in order to identify cell or tissue structures or microorganisms. A reagent or dye used for staining microscopic specimens. 1 n, a pigment, dye, or substance used to impart color to microscopic objects or tissues to facilitate their examination and identification. Kinds of stains include acid-fast stain, Gram's stain, and Wright's stain. 2 v, to apply pigment to a substance or tissue to examine it under a microscope. 3 n, an area of discoloration. 4. A dye used in histologic and bacteriologic technique. 5. A procedure in which a dye or combination of dyes and reagents is used to color the constituents of cells and tissues. 5. A procedure in which a dye or combination of dyes and reagents is used to color constituents of cells and tissues. v 1. to discolor with foreign matter. n 2. a discoloration accumulating on the surface of teeth or dentures. 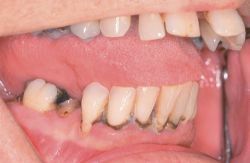 n a brownish discoloration of the teeth and exposed roots that occurs as the result of using mouthrinses containing the antiplaque agent alexidine. Stains are more frequent on tooth surfaces that are difficult to reach during normal brushing. 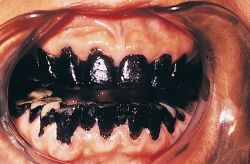 n the thick, hard, dark brown or black extrinsic stain left on the teeth after chewing the leaves of the betel palm; commonly seen in adults and children in the Eastern Hemisphere, where betel leaves and nuts are used as stimulants; must be removed by scaling. black stain. See also plaque, pigmented dental. n a discolored area on a tooth that results from internal biologic conditions as opposed to outside or environmental factors. See also stain, intrinsic. n a discolored area on a tooth caused by factors from outside the tooth. See also stain, extrinsic. n a discolored area on the surface of a tooth that is caused by an external source such as cofee, tea, or tobacco, as opposed to an internal source, such as illness or genetic defects. These do respond to whitening, polishing, brushing, flossing, or scaling until they become more intrinsic over time. gram-negative, which decolorizes but counterstains with a red dye. n a light to very dark green extrinsic stain appearing primarily on the labial surface of the teeth due to inadequate daily removal cleaning, chromogenic bacterial deposits, or decomposed hemoglobin. It may also represent stained enamel cuticle (Nasmyth's membrane). The condition is more common in children than adults. n a discolored area found on the inner layers of the dentin. They may be caused by certain medications, such as tetracycline or excessive fluoride exposure, or by illness or genetic defects. These do not respond to polishing, brushing, flossing, or scaling but can be lightened with dental whitening. n an uncommon, green, brown, yellow, or blue-green dental discoloration. Source is environmental, typically entering the individual's oral cavity through breathing air containing metals or metal salts. n a dye used to color bacteria for microscopic examination. n an extrinsic stain of the cervical third caused by chromogenic bacteria. n an extrinsic stain caused by chromogenic bacteria; found at the cervical third. n a frequently occurring extrinsic stain of the teeth, generally caused by poor oral hygiene. If more orange in color, it may be due to topical use of stannous fluoride. a stain in which the coloring agent is in the acid radical. a stain in which the coloring agent is in the basic radical. used to stain some gram-negative bacteria, including Campylobacter fetus. a technique for demonstrating chlamydial elementary bodies, using formol blue and safranine. one containing methylene blue, maltose and azure II, used for staining mycoplasmal microcolonies. one which facilitates differentiation of various elements in a specimen. a staining method employed universally for routine histological examination of tissue sections. used to demonstrate capsules on Cryptococcus neoformans and some bacterial species. staining of the breech and back of the udder of a ewe caused by the passage of the fetal fluids and then the lochia. Used as a guide to whether or not the ewe has lambed and perhaps lost her lamb. a basic fuscin solution for staining chlamydial elementary bodies. one that produces in certain elements color different from that of the stain itself. stains fungal elements in tissue a dark brown. a metachromatic dye used for staining blood, vaginal smears, and tissue samples for cytological examination. Particularly useful in demonstrating reticulocytes. used on smears of milk for demonstrating organisms in mastitis. an aniline dye used in wet mounts to demonstrate capsules, especially with cryptococcusneoformans. one that selectively stains cell nuclei, generally a basic stain. used in the diagnosis of diseases of the eye, e.g. fluorescein and rose bengal dyes. a stain introduced in living tissue or cells that have been removed from the body. an area of increased density in a radiograph, due to collection of contrast material in distorted and abnormal vessels, prominent in the capillary and venous phases of arteriography, and presumed to indicate neoplasm. a stain introduced into the living organism, and taken up selectively by various tissue or cellular elements. Often used to determine the live/dead cell ratio in a cell population. a mixture of eosin and methylene blue, used for demonstrating blood cells. one of carbol fuchsin counterstained with methylene blue; used to demonstrate acid-fast organisms, especially Mycobacterium spp., in smears and tissues. A modified method using mild acid to decolorize is used for staining Brucella spp. and Nocardia asteroides. See also acid-fast.